Simon & Schuster/Paula Wiseman Books, 9781416958888, 40pp. 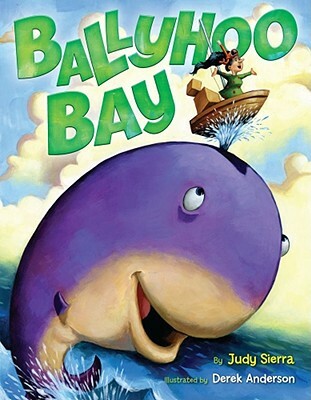 Welcome to Ballyhoo Bay, where Mira Bella the artist teaches painting and sculpture to grannies and kids. Sun, sea, sand, and sky - what could be more fun? Until one gray day a billboard goes up, announcing a high-rise building and all kinds of stuff. No more sand or seashells or painting or fun. And absolutely no children and wildlife allowed. Mira Bella is not one to take this plan lightly. But despite Mira Bella's conviction, can art save Ballyhoo Bay? Mom's Choice Award winner and E.B. White Read Aloud Award recipient Judy Sierra has created a modern fable for the ages, celebrating art, nature, and community. Derek Anderson's vibrant and buoyant illustrations are as close as you can get to a day at the beach without actually being there. Come put your toes in the sand at Ballyhoo Beach!